We have a purpose built machine for grinding stumps. 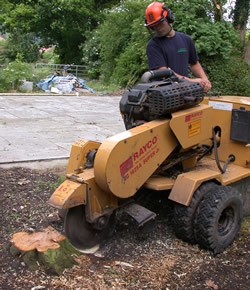 This is ideal in the domestic situation where the removal of much of the stump will allow the visual impact of tree felling in your garden to be reduced. The machine works using special teeth to grind out the stump to produce woodchips. These woodchips are generally left for your own use. On larger sites we utilise excavators to remove stumps which can be broken up or fed into tub grinders.